Miami Boating News :: This Season's Gift May Just Save a Life! This Season's Gift May Just Save a Life! Show the boater, angler, sailor or watersports enthusiast in your life that you care enough to keep them safe. The Florida Fish and Wildlife Conservation Commission (FWC) has a suggestion for anyone shopping for a boater this holiday. A new, comfortable life jacket makes an ideal gift, and it could save someone's life. "A lot of people don't wear life jackets because they feel they're uncomfortable," said Capt. Tom Shipp of the FWC's Boating and Waterways Section. "However, with newer models, such as belt packs or suspenders, you hardly feel them. Replacing an old, bulky life jacket with a newer model makes a great gift." Belt-pack and suspender life jackets are inflatable. Some inflate automatically when a person falls into the water, while others inflate after the wearer pulls a cord. Prices of the belt-pack and suspender life jackets start at approximately $60. "Frequently, a life jacket can save a life during a boating accident," Shipp said. One of the main responsibilities for FWC officers is helping residents and visitors boat safely. They often check boaters for adherence to safety regulations and educate them about safe boating practices. Unfortunately, at other times, FWC officers are called to the scene of boating accidents. "Many people don't expect to need a life jacket, particularly if they feel they are good swimmers," Shipp said. "However, when boating accidents happen, you may not be able to rely on your swimming skills." 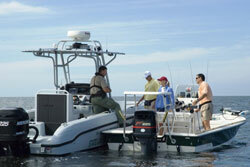 Many of the boating accidents the FWC investigates involve drowning deaths. Last year, there were 79 boating fatalities - 49 of them by drowning. The FWC confirms that life jackets may have saved those lives and recommends boaters wear one at all times on the water. Bottom line: If you fall overboard with a life jacket on, your chances of survival are greatly enhanced. This holiday season, the gift of a life jacket could be a gift of life. For more boating safety information, visit MyFWC.com/Boating or call 850-488-5600.